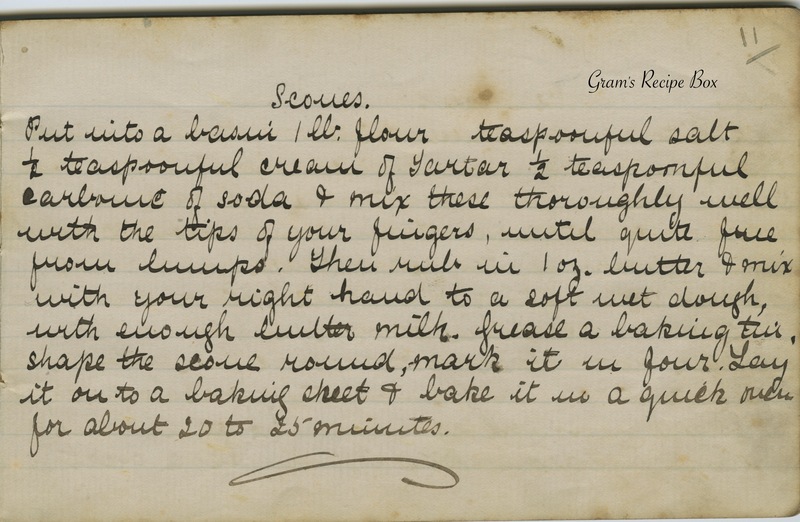 Put into a basin 1 lb flour, teaspoonful salt, 1/2 teaspoonful cream of tartar, 1/2 teaspoonful carbonic of soda & mix these thoroughly well with the tips of your fingers, until quite free from lumps. Then rub in oz butter & mix with your right hand to a soft wet dough, with enough butter milk. Grease a baking tin. Shape the scone round, mark it in four. Lay it onto a baking sheet & bake it in a quick oven for about 20 to 25 minutes.